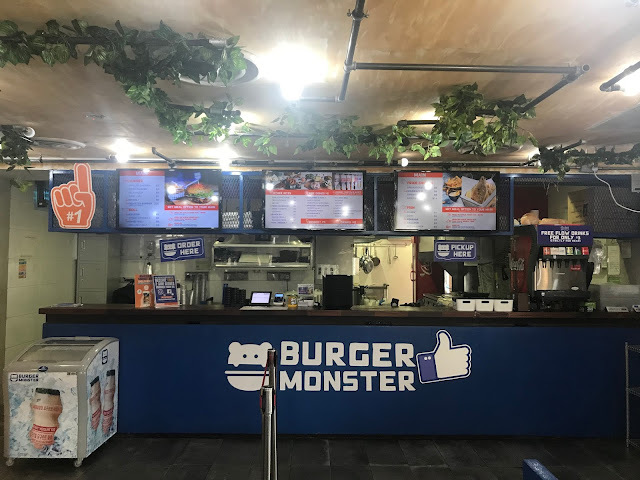 Burger Monster has taken over the spot previously occupied by Chicken Up at level 1 of Jurong East MRT station. 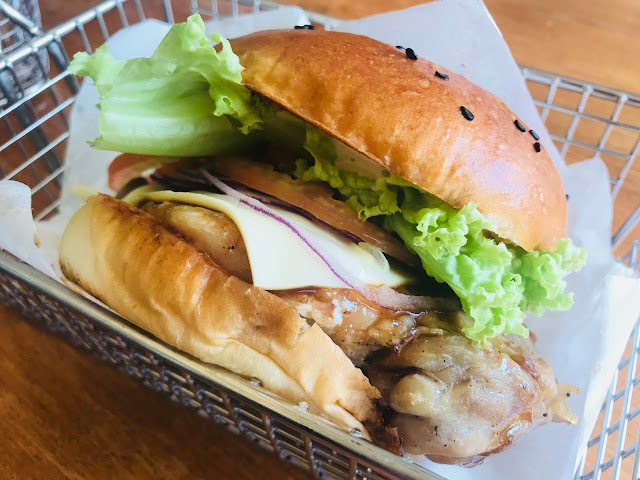 Opened by the same people behind Chicken up, Burger Monster is the first restaurant in Singapore to serve Korean burgers. 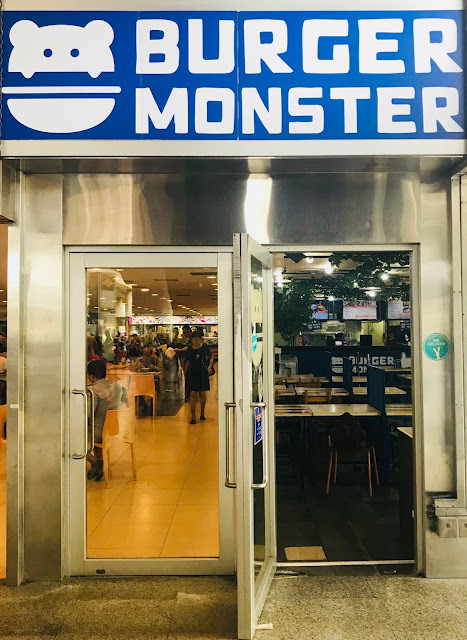 Monster Burger serves burgers, rolls, fried chicken and fried fish alongside other dishes and $2 side dishes. 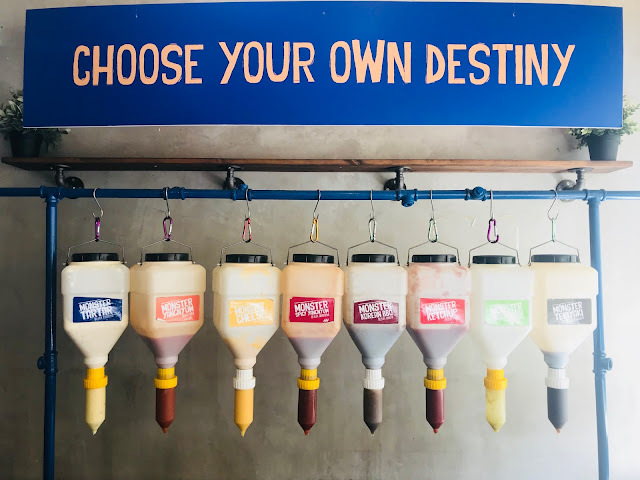 What sets Monster Burger apart from other burger restaurants is their sauces. They don’t just have one, two or three sauces to choose from … they have eight different sauces to choose from. Monster Tartar, Monster Yangnyum, Monster Cheese, Monster Spicy Yangnyum, Monster Korean BBQ, Monster Ketchup, Monster Wasabi Mayo and Monster Teriyaki. 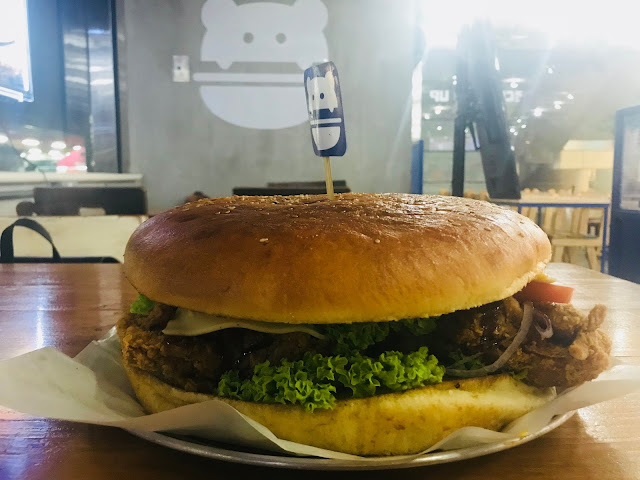 Monster Burger (Chicken/ Beef) [$20] is the signature dish and it is a massive 10-inch burger meant to be shared between 2-4 people. This is the super-upsized version of the Fried Chicken Burger [$5]. Crispy fried chicken, sliced tomatoes, crisp lettuce and cheddar cheese are sandwiched between two huge buns. Eating this is going to be a messy affair but the combination of tastes makes up for it. If you are not a fan of fried food, there is Grilled Chicken Burger [$5]. Nothing really special about it, except that the burger is much bigger than McDonald burgers. The other burger options are Mushroom [$5], Dory Fish [$5] and Shark [$5]. 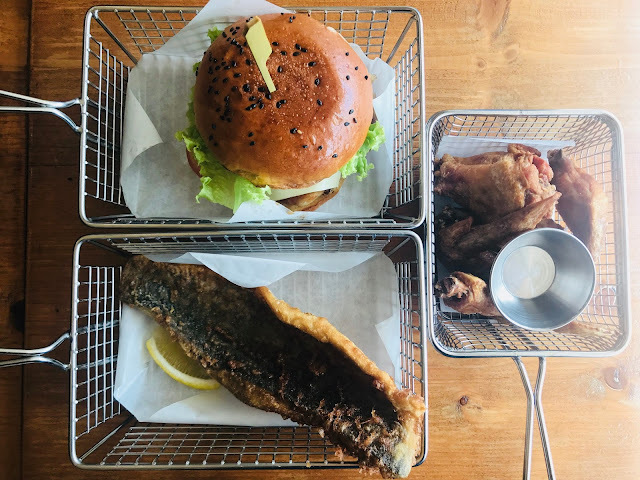 This is the first time I am seeing fried fish served in a burger place, perhaps it’s a Korean thing? 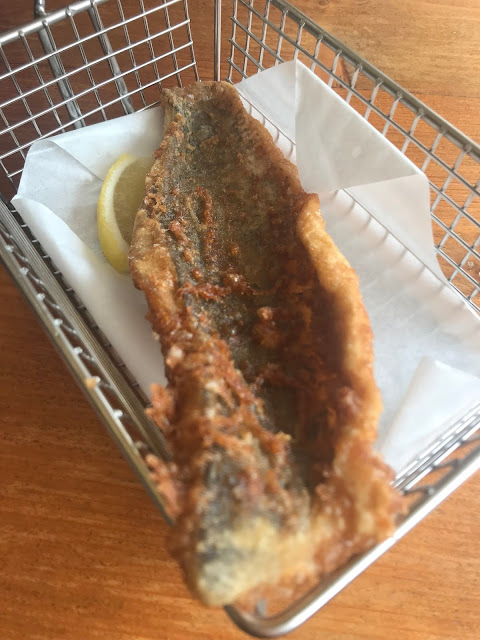 I got the Seabass [$8] as recommended by the staff and it is alright. The fish is fresh with tender flesh and the outside is fried till it’s crackling crispy. Eat it with the 8 different sauces for a difference in every bite. 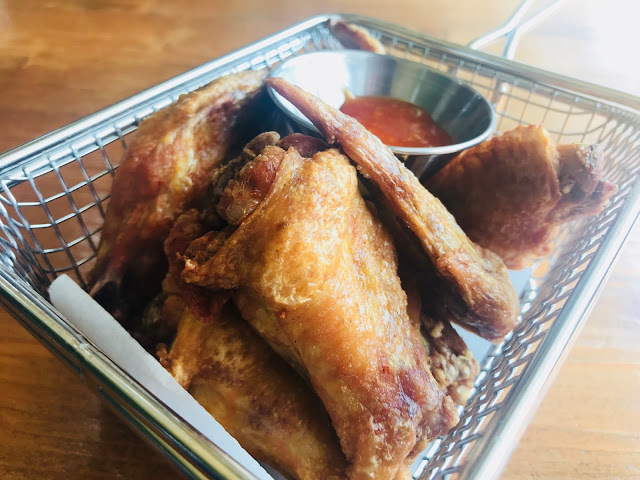 Since Monster Burger is opened by the same people behind Chicken Up, I was expecting the same juicy chicken that Chicken up used to offer, but Monster Burger’s Wings (6 pieces) [$8] taste very similar to 4Fingers’s chicken wings which are of the drier kind. It’s fun having them with the 8 different sauces though. The other chicken options are Drumsticks (3 pieces) [$6], Spring (Half) [$8] and Spring (Whole) [$14]. 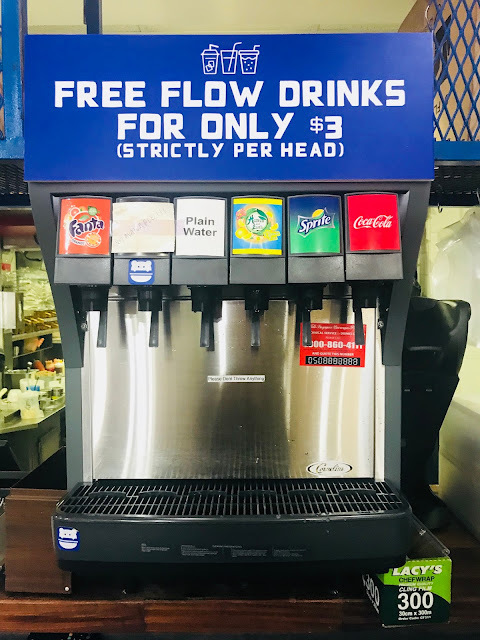 You can get free-flow soda drinks for $3 per head. There is Fanta Orange, Plain Water, Heaven and Earth Iced Lemon Tea, Sprite and Coca-Cola. 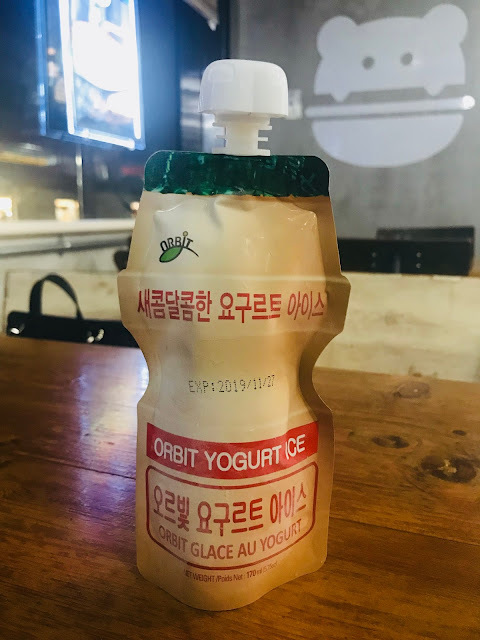 Yakult Ice Cream [$4] is supposed to be a dessert, but you can also treat it as a drink. It will be served to you frozen, so I suggest that you order it together with the rest of your meal so that it can thaw as you enjoy your burger. The sweet and sour ice drink diffuses the oiliness from the food and aids in digestion too. 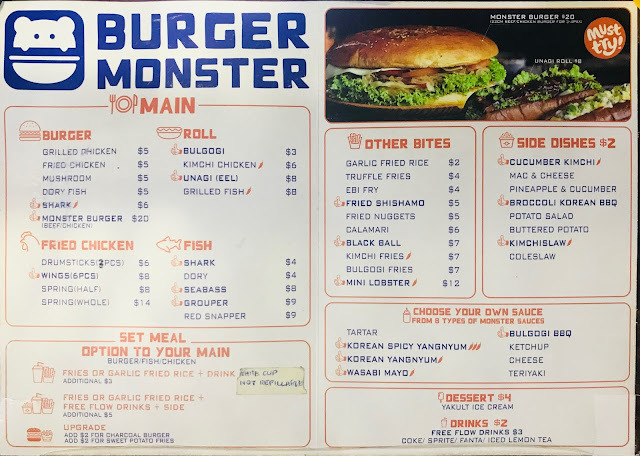 If you are looking for a place to have a good burger without having to venture out of Jurong East MRT station, Monster Burger is a good option. Service is quick and the food is reasonably priced. If you are lazy to come down to Jurong East, Monster Burger is available for delivery via Deliveroo, Foodpanda and Honestbee.